Adam Miller presents one of his American Folk Music Programs for Libraries, entitled “Singing Through History”. Folk songs always tell a story. But when you add a storyteller with an autoharp to the mix, you have entertainment at its best. Adam Miller is an extraordinary storyteller as he weaves the history of our nation and the world into the introductions of the folk songs that he sings. 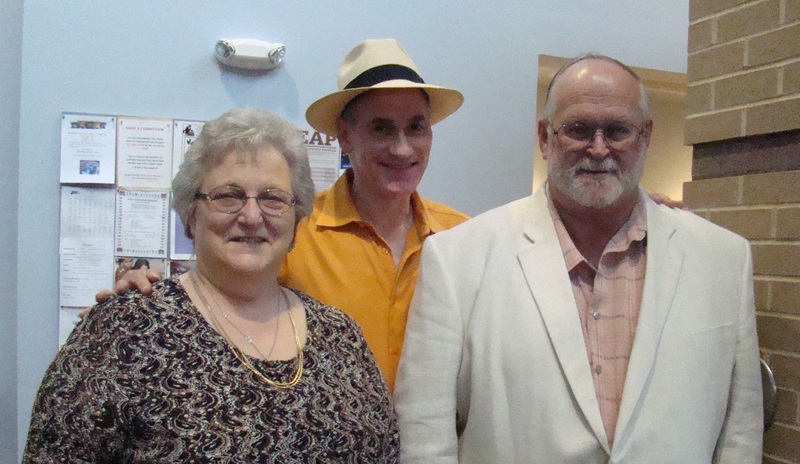 That’s not to mention his fantastic ability at the autoharp and guitar, as he delights the audience with song after song in his rich baritone voice. The magical way Adam weaves history into his program makes history seem very exciting for everyone. “Of course,” Adam remarked, “history is better than fiction.” Often he performs for school groups and they, too, find him fascinating. To date he has performed for over 1,000,000 students as part of his journey from the Everglades to the Arctic Circle. 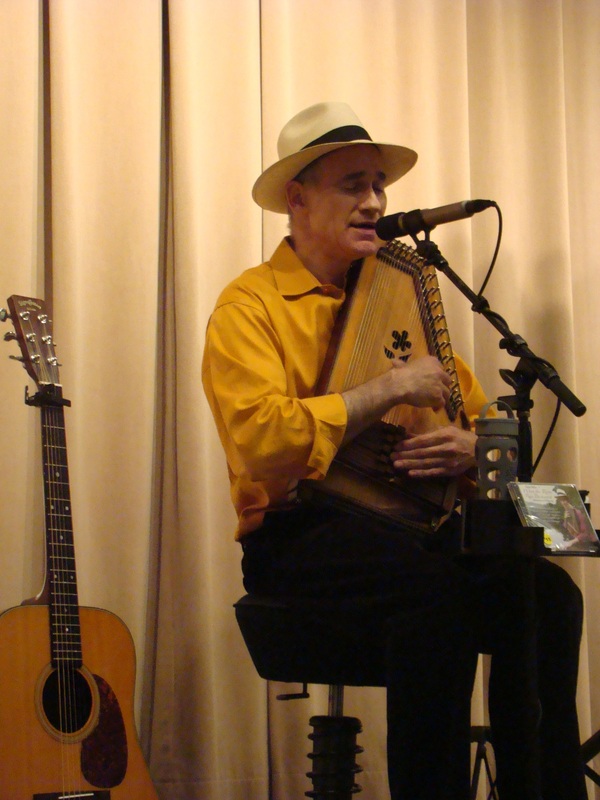 Adam Miller performs folk music using his autoharp. While the guitar is the most popular instrument in the US today, it wasn’t long ago that the autoharp had that prestige. A hundred years ago Sears catalogue had autoharps listed for $6.95 and many teachers used them in their classroom. Adam’s ability with the autoharp far surpasses any this gypsy has seen. The fluid sound resounded without any apparent effort on his part. Involving the crowd seemed to come naturally to Adam as he often works with school groups. Frequently throughout the program, he had the audience singing along on choruses. Since this fantastic musician appears at approximately a hundred libraries a year, he has much practice. 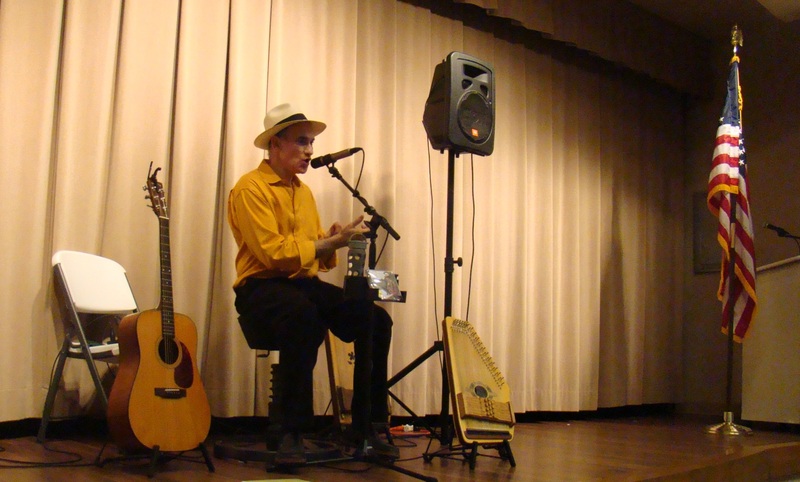 A repertoire of folk music programs called “Singing Through History”, which he uses at the library presentations, ranges from “Old Songs for Young Folks” to “Steamboatin’ Days”. Jerry and Joan Albaugh from Friends of the Library were instrumental in bringing Adam Miller to Cambridge. Friends of the Library at Cambridge, Ohio were certainly fortunate to connect with Adam Miller. This busy man travels over 70,000 miles a year as he goes from town to town sharing his love of folk music. He builds his show on whatever people want. The story began in Ireland, where the potato famine destroyed many families and left children orphans. Many youngsters were sent to the U.S. for a chance at a better life. That didn’t actually happen where they landed near New York City, so a Catholic priest there raised funds to send them, and orphans left by the Civil War, by train to the new western settlements to help build railroads among other things. In a short period of time, 250,000 children rode west on what was soon to be called the Orphan Train. 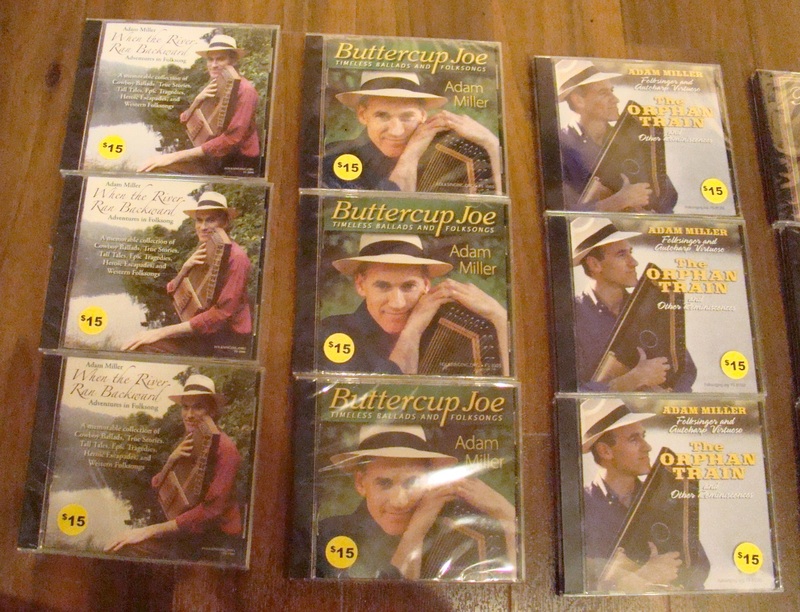 Adam’s CDs help make his love of folk songs live on even after he has left the area. The oldest folksong. which has been around over five hundred years, has many different versions. That timeless ballad, “Froggy Went a Courtin”, moves at a rapid fire pace, but with the theme of a frog dating a mouse, it seems humorous that it became so popular. Even as a child, folk songs captured Alan’s heart and he began collecting these old songs back when he was in grade school. His goal was to learn every song he heard. Today Adam knows and performs over 5,000 songs through his large repertoire of shows. There’s no doubt that he is a master at what he does, and he does it with enthusiasm. Exceptional entertainment! If your school, group, or library would like to contact Adam Miller for a program, email him at autoharper@earthlink.net or visit his website at http://www.Folksinging.org. Here you can also purchase some of his CDs, which are very entertaining and relaxing.